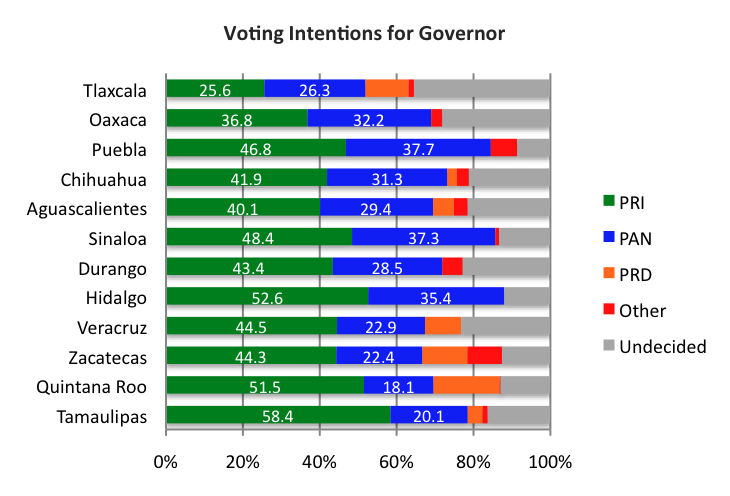 With three weeks to go before the July 4 elections, the PRI has solid leads in most of the 12 gubernatorial races, based on GCE and Mitofsky polls from late May and early June. In the nine states that it currently controls, the PRI is being seriously challenged only in Oaxaca and (perhaps) Puebla. According to pollster GCE, Eviel Pérez has a 37%-32% lead over PAN-PRD coalition candidate Gabino Cué in Oaxaca, but 28% are undecided. In Puebla, Javier López has 47% compared to panista Rafael Moreno Valle’s 38%. In the other seven states, PRI candidates have double digit leads over the PAN challengers. This entry was posted in Elections, Polls. Bookmark the permalink.